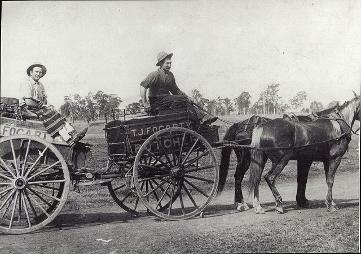 T.J. Fogarty Butchery horse and cart, [Weston, n.d.] Courtesy of the Coalfields Heritage Group. Les Brown – Founder of Rover Motors. Recorded 22 August 1983. Marjorie Ellen Patrick née Russell (1902-1993) - Patrick Horse Buses. Recorded 5 December 1983. Tom Patrick (1914-1985) - Patrick bus company, Cessnock. Recorded 4 December 1983. Peter Phillips - Owner of Kearsley Bus. Recorded 13 October 1983. Talk on the history of Windermere, given to Cessnock Historical Society. Recorded 12 April 1985. John "Bunny" Snaddon - Bus driver, Cessnock area. Recorded 9 November 83.